There's a portion of you who cringed when you read the title of this post...another portion who cheered, and still others who asked, "What the heck is Fernet?" It's popular in Italy, Argentina, and...San Francisco. Go figure. In fact, 50% of the Fernet consumed in the U.S. each day is consumed in San Francisco. It actually has a really cool history in this city, dating back to the Prohibition days. I highly suggest checking out this article from SF Weekly a few years back. And while I too was among those who didn't like the taste initially, I've come to love and embrace Fernet, and it's one of my go-to drinks nowadays. 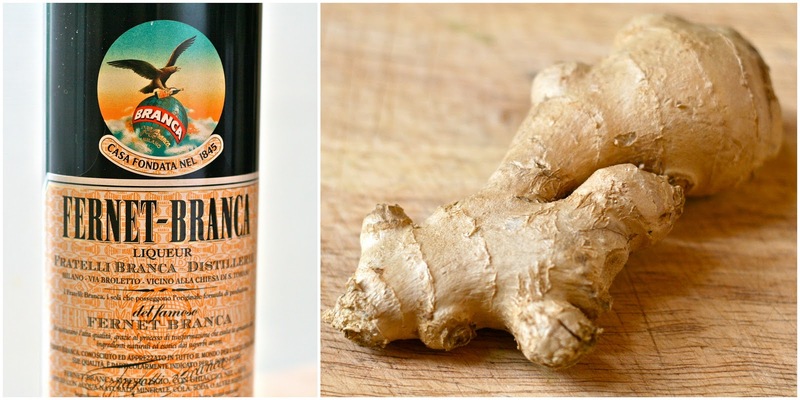 A popular way to order the digestif is with a "ginger back"...as in a chaser of ginger ale. Some people say this only for rookies, but I happen to enjoy the way the ginger ale compliments the liqueur. In fact, one of my favorite San Francisco restaurants, Park Tavern, came up with a creative twist on this by making it into a tasty dessert. They serve a boozy float that includes Fernet ice cream, a shot of Fernet, and some Ginger Beer. 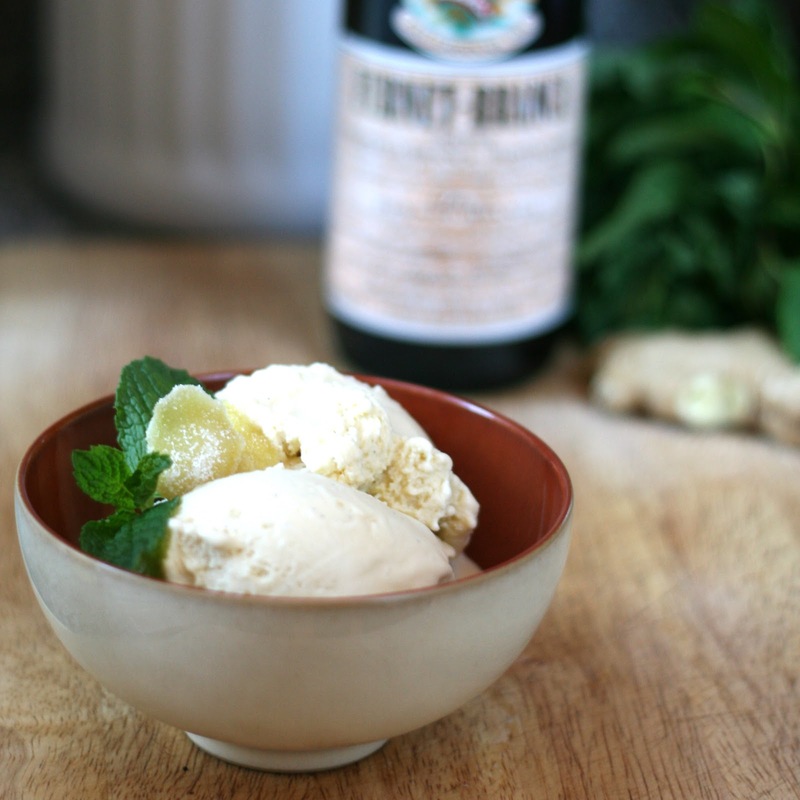 I was inspired to come up with my own Fernet-inspired dessert, so I decided to do Fernet ice cream with a ginger syrup topping and candied ginger garnish. Of course, you'l need some fresh ginger. I used about 1/4 of a pound, which equalled almost 3/4 cup when sliced. First peel it (yes, I own a ginger peeler...thank you Devon), slice it really thin, and combine it with a cup of sugar and one cup of water in a small saucepan. Bring to a boil and then reduce to a simmer. Cook for about 45 minutes, or until liquid has reduced and reaches a thick, syrupy consistency. As I did with the Roasted Strawberry Balsamic Rosemary Ice Cream awhile back, I wanted to do a custard base to achieve maximum creaminess. To do this, you'll need about 5 egg yolks. You'll also need to "temper" the eggs so they don't scramble. To do this, mix a little bit of the warm milk mixture into your whisked egg yolks. I do this little by little (ending up adding about 1/4 cup to 1/2 cup total), and then whisk the egg mixture back into the pan. In the meantime, prepare an ice bath and set a container inside with the remainder of the cream. (I also added about a tablespoon of the ginger syrup just for fun :)) Once the custard has finished, pour it into the chilled cream and continue stirring until mixture has cooled down significantly. At this point, add 2 tablespoons of Fernet-Branca. No, I know it doesn't sound like a lot, and I considered adding more but was afraid the ice cream wouldn't freeze properly. Add more if you'd like, but don't say I didn't warn you! Cover and store in the refrigerator for at least four hours, or preferably overnight. When you are ready to make your ice cream, simply freeze according to your manufacturer's instructions. If you prefer soft-serve consistency, eat right away...otherwise, transfer to a freezer-safe container and freeze for a couple more hours. When you're ready to serve it...garnish with a sprig of mint and a couple slices of candied ginger. Drizzle with ginger syrup! The result? A delicious dessert for Fernet-lovers and Fernet-haters alike! No seriously...I even tested it out on my friend Amy, who isn't exactly a Fernet fan. The taste is super subtle (maybe even too subtle for some), and I think the creaminess of the ice cream really balances out the strong medicinal taste of the alcohol. Either way...this was a hit and I'll definitely be making it again. Salute! I also wanted to let everyone know that I will be taking another hiatus from the blog for a few weeks. I'm ecstatic to report I'm headed to Australia for some much needed vacation and to attend the wedding of my dear friend Jenna (who, coincidentally, was my dinner companion during my first visit to Park Tavern). Not to worry, I promise to document my adventures (and my food) thoroughly and post some of the highlights here on the blog. Have a great two weeks everyone! Combine 1 cup of the cream, milk, sugar, salt in a small sauce pan. Split vanilla bean down the middle and scrape insides into cream mixture. Place vanilla bean pod in pan as well and heat until very warm, but not boiling. Prepare an ice bath. Fill a large bowl with water and ice. Place a smaller bowl inside and pour in other cup of cream. Remove bean pod and strain custard into chilled bowl with the cream. Stir in Fernet and ginger syrup. Stir until mixture has cooled down considerably. Refrigerate for at least four hours or overnight. Freeze in an ice cream maker according to manufacturer's directions. Enjoy immediately if you prefer a "soft serve" consistency, or freeze for an additional couple hours for more traditional ice cream consistency. Drizzle with ginger syrup and garnish with a few pieces of candied ginger. Combine sliced ginger with a cup of sugar and one cup of water in a small saucepan. Bring to a boil and then reduce to a simmer. Cook for about 45 minutes, or until liquid has reduced and reaches a thick, syrupy consistency. Strain and allow mixture to cool. Transfer to a squeeze bottle or other airtight container and store in the refrigerator. Spread cooked ginger slices out on a cooling rack with a cookie sheet underneath. Sprinkle with sugar and allow to dry completely. Can I use whole eggs instead of just the yolks? I have been making a salted caramel ice cream with whole eggs, and it's very creamy and yummy. Made it. Everyone loved it. With the vanilla gave it a rootbeer float taste.